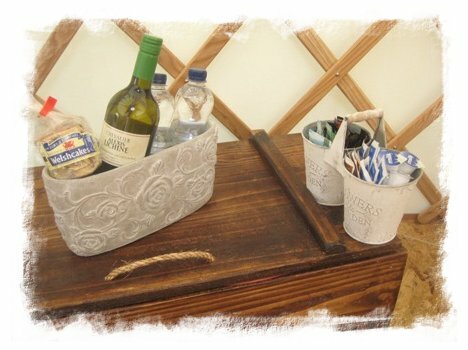 • Our 2019 yurt season runs from Friday 17th May to the end of September. 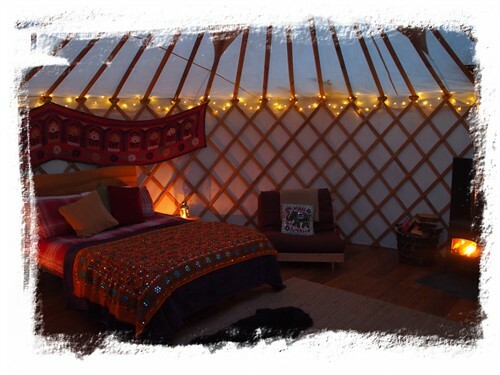 Based upon a Mongolian round pod design, our yurts offers high levels of comfort giving a warmer, drier 'glamping' (glamorous camping) experience in the stunning Pembrokeshire countryside. Sited on raised wooden platforms, they are beautifully furnished with quality beds, futons, rugs, cushions and sheep skins to add to the homely ambiance. Our yurts are 20ft in diameter and they have full height walls and doors for a more spacious feeling. Each yurt accommodates 4/6 people in 1 double bed and 2 single futons, however, if your party consists of 5/6 people you are welcome to bring your own bedding or pitch a small tent on the grass area next to your yurt. Please note there is a maximum of 4 adults allowed per accomodation. Perhaps the highlight of our yurts are their private eco wood-burning hot tubs which allow for total and utter relaxation underneath Pembrokeshire skies...day or night! And don't worry - we even supply your wood so you can just sit back and enjoy. In your private, fully equipped canvas-covered camp kitchen you'll find a gas cooker and all the utensils you will need for your glamping break. Your campfire and picnic bench are just perfect for al fresco dining and spending proper quality family time together. Your private garden space is ideal for sunbathing, to play games or for the kids to camp and each yurt has its own outside compost toilet, along with family communal showers closeby on site. Large freezers are available at the shower block where ice packs and blocks can be frozen and replenished to go in your cool boxes. Private charging lockers are also available to recharge you electrical items, which can be locked away safely. Our yurts are even dog friendly so the whole family can enjoy your glamping holiday in Pembrokeshire, with an additional cost of £40 for a dog. You'll find an array of beautiful dog-friendly beaches nearby and Heatherton World of Activities even has a dog agility course - literally a stone's throw away! 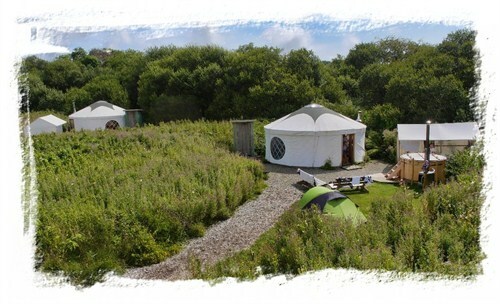 If you're dreaming of a yurt holiday in stunning Pembrokeshire that offers you the peace of the countryside whilst being close to activity parks, famous coastal walks and beaches around Tenby and Saundersfoot, then Florence Springs offers the ideal getaway for you and your family. 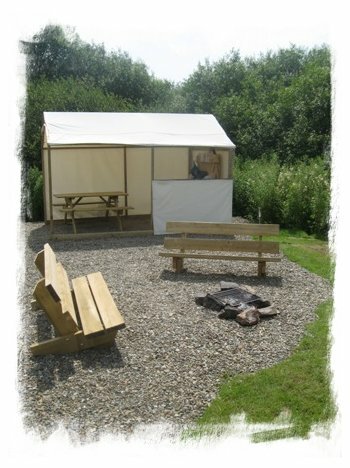 It's the ultimate glamping experience in Pembrokeshire and we would love to welcome you to Florence Springs! As you are camping it is advisable that you take out holiday insurance to cover your items and do not leave valuables unattended in your yurt.